Waxing poetic may have worked to win a woman’s heart in times of yore, but these days words are a dime a dozen (and a dime doesn’t go very far these days either). Showering a lady with words and gifts is more of a red flag than a sign of affection these days, so wooing a fair maiden in the modern age takes a certain finesse and attention to detail. 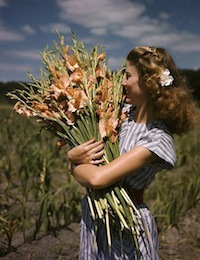 In a time of super-sized everything, these strikingly simple stems are the quickest way to a woman’s heart. 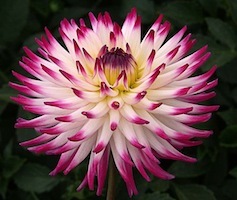 Just like no two women are alike, the diverse color, shape and size of each dahlia makes each one look like the only one of its kind. A summer and fall blooming garden favorite, this flower is highly prized by amateurs and professional florists alike for the incredibly intricate arrangement of its petals. Related to the sunflower, the dahlia can have a yellow center with brightly colored petals arranged around that in a ray. Through specialized cultivation practices, many dahlias now have hundreds of showy petals with a hypnotic display of firework colors. The perfectly round, green buds of each one opens up to a dazzling display of deep, dark magenta, florescent pinks and yellows or blooms with 2 or 3 different colors. With some the size of dinner plates and other so dainty and perfect they looked hand-carved, there is one that will absolutely captivate the woman you are courting. 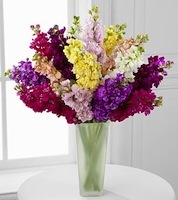 Don’t dilute this amazing bloom with greens or other flippant flowers. Just like true love- it’s best to chose just one that is very special. 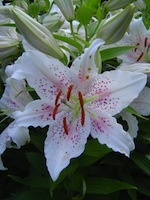 Whether she knows this or not, the stargazer lily is her favorite flower. The large, lovely white and pink blooms opens up more than 5 inches across and fill the room with a rich, fresh fragrance that can’t be captured in perfumes or scented candles. Just one of these delicate stems in a narrow vase on her bedside will fill her dreams and have her looking forward to seeing you in the morning. This plant is not easy to find, but neither is a good woman. 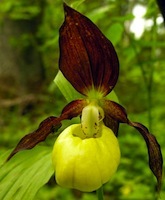 Furtively native to parts of North America, these uniquely-formed species of the genus Cypripedium look like they’ve sprung out of a fairy tale. If you can’t wander through an enchanted forest, you can find them at upscale florists and nurseries these days in a simple pot and still seem like her Prince Charming.